﻿ How to treat stye on the upper eyelid? Types, symptoms. 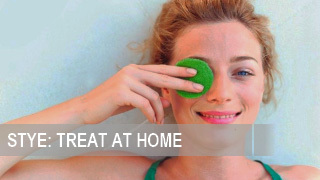 Home » How to treat stye on the upper eyelid? Stye on the upper eyelid is a quite common disease of eyelashes base or meibomian gland. Depending on the type of the disease, stye has different symptoms. 1. External stye is an inflammation of the sebaceous glands on the eyelid, which is accompanied by an acute course. 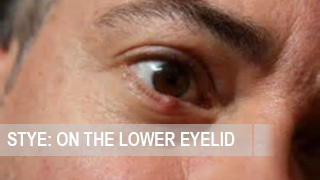 At the beginning of the disease, there is a swelling and redness of the edge on the upper eyelid. Some patients have a large swelling so it is impossible to open the eyes. Others have not so large. The severity of pain directly depends on the edema size. In a few days, there is a spot with a purulent head formed in the middle of a swelling site. Eventually, pain is reduced, stye bursts in 2-3 days, and purulence comes out of the capsule. Redness and swelling disappear in about a week. After a stye capsule bursts, there can be an inconspicuous scar. Although, in most cases there are no consequences. 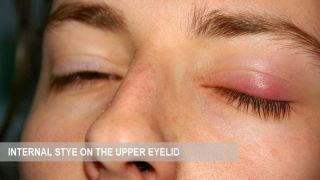 Click here for pictures of external eye stye. 2. 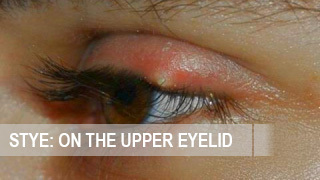 Internal kind of stye on the upper eyelid has similar symptoms as the external one. 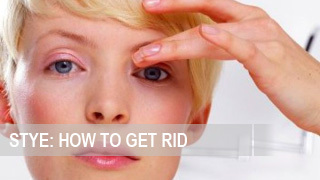 However, its main difference is that the inflammation occurs in the inner tissue on an eyelid. Stye on the upper eyelid is accompanied by pain and swelling, festering is close to the conjunctiva. In most cases, internal stye capsule bursts in the conjunctival sac. Regardless of the type of eye stye, you should not start the treatment without consulting a doctor. Any manipulations with an abscess at home can cause a risk of spreading infection. 1. Treatment of stye at early stage. Dry heat, UHF and blue color therapy. Inflammatory area is covered with a solution of iodine, brilliant green 1%, or 70% medical alcohol for at least 3 times a day. Instillation of eyes with eye drops such as ciprolet, similasan, dexamethasone, floxal for at least 5 times a day. Using hydrocortisone and tetracycline ointments before the bedtime. Combined means therapy, such as tobradex ointment or tobrex eye drops. 2. 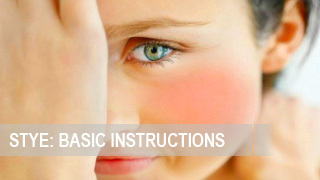 Treatment of stye on the upper eyelid when there are abscess and complications. 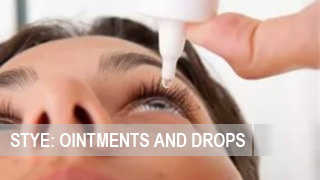 Using of the eye drops (ciprolet, dexamethasone, similasan, chloramphenicol, etc. 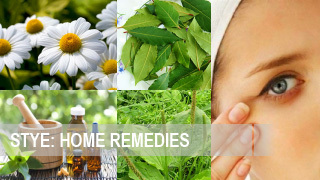 ), anti-stye ointments (tetracycline, floxal, hydrocortisone, etc.). If the body temperature is high, it is recommended to make per oral antibacterial treatment, e.g. intake of penicillin drugs. In the case of severe state of a patient, antibiotics are injected intravenously or intramuscularly. In case of severe purulence or prolonged drug treatment with no result, surgical intervention should be.For example, the dissection of a stye capsule and drainage of the stye cavity. For this purpose, a small incision are made on thin skin. 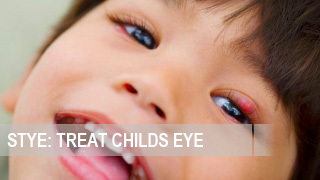 If stye appears very often, and the disease is severe, it is important to make a diagnosis. It includes the consultation of the endocrinologist, gastroenterologist, internist, and immunologist, blood count, testing blood for sugar levels, sterility and immunogram. Moreover, do not forget about the recovering treatment that involves taking vitamins and proper nutrition. It will help to normalize defecation and strengthen the body’s defenses. Thus, the risk of stye emergence will be reduced.